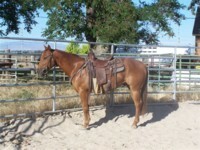 Here are some of the horses we've sold. 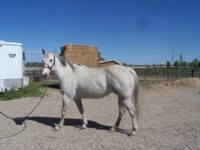 We will post testimonials from their new owners as we receive them. 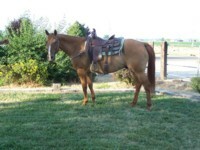 "RUSTY" - Great trail gelding! 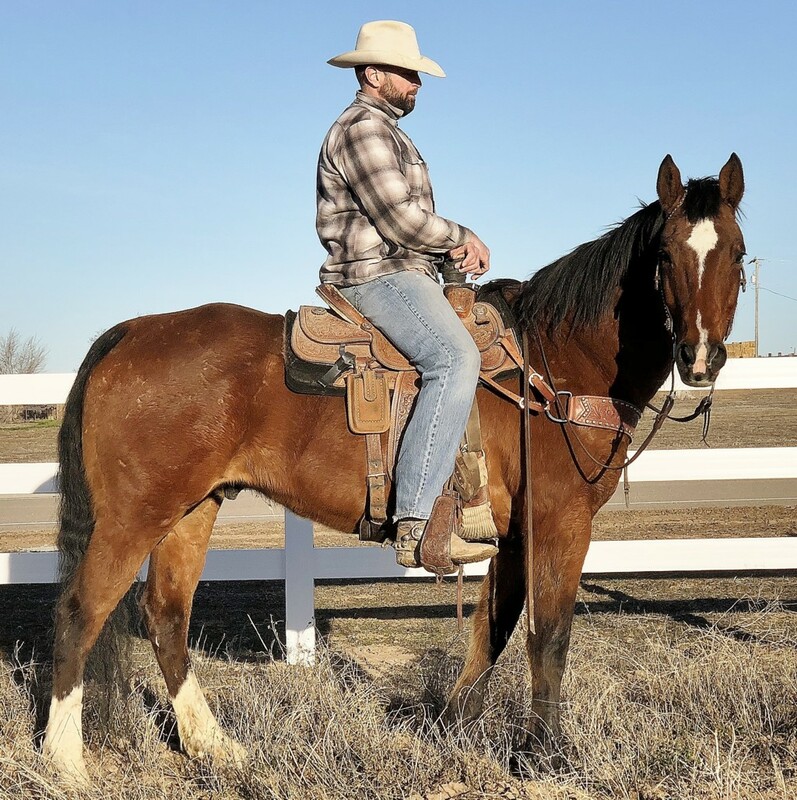 Ride or pack, Rusty does it all and can really cover some country. 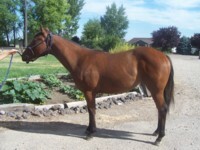 Registered Pervvian Paso, foaled 6/24/02, registration # 18061. 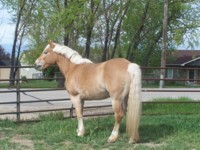 Beautiful chestnut with flaxen mane and tail. 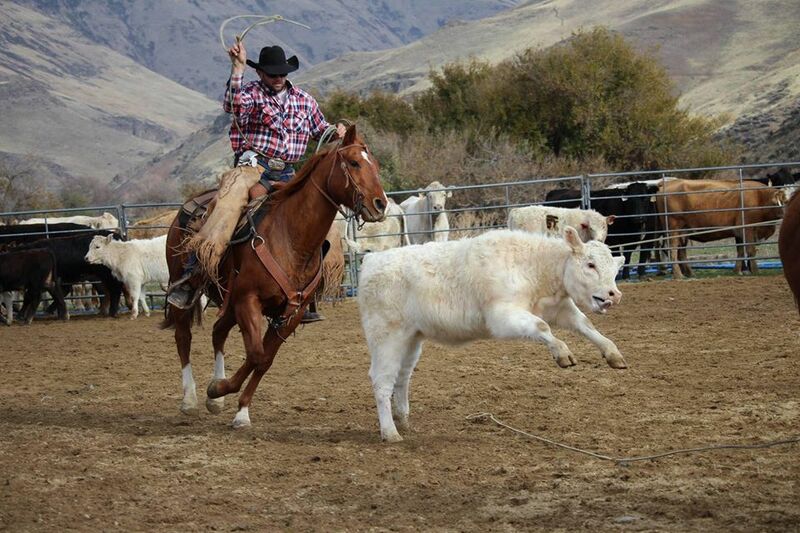 15 hands, 1150 pounds, great bone and feet. 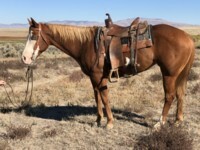 This is a tough and strong mountain horse. 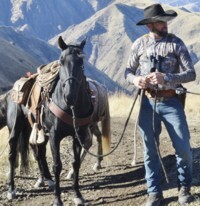 He's spent many days in the Idaho backcountry hunting and packing. 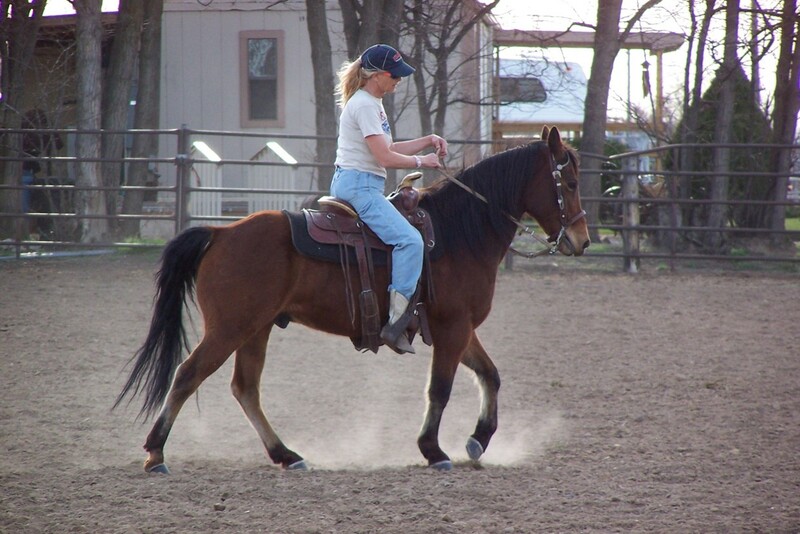 He has a wonderful gait that is so smooth to ride! 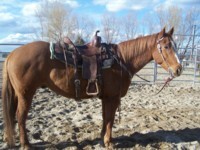 Gets along well with other horses, a very easy keeper, and a sweet back country partner. 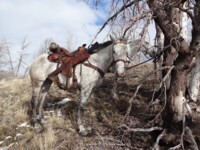 This horse has seen it all on the mountain trails. He won't quit when you need him and he's safe and sane. 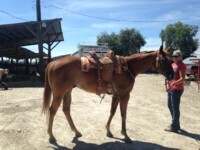 Sold 8/16/17 Just wanted to let you know mom took Rusty to Pomerelle today and rode for about 3 hours. She said he's a gem. She is so happy with his abilities. 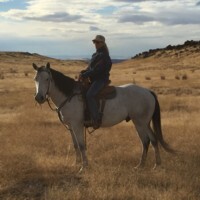 Could not ask for a better horse to take care of my 80 year old mother. Thank you. 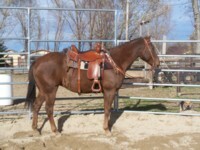 CNC BudsRFree, 2012 AQHA Brown Gelding. Barrel and performance horse prospect. 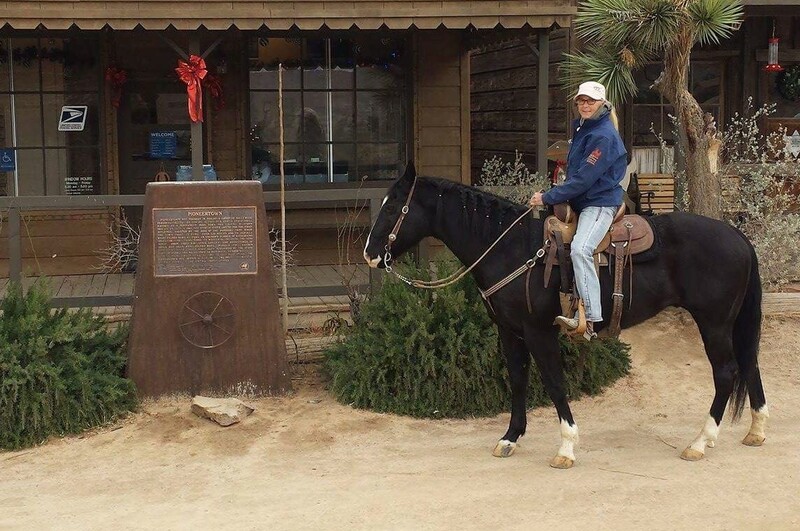 "Bud" was raced lightly and came off the track sound and sane. 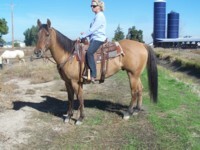 He's had 15 rides in a stock saddle and will continue in training until sold. 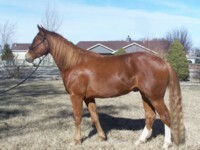 Gentle, smart, quick footed, wicked fast - He could easily be ready for the summer barrel futurities. 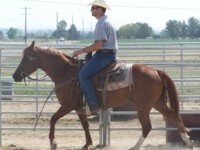 He's easy to train, he loves people, has a laid back attitude and a big heart. 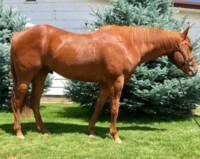 Great conformation and breeding - Afleet, Bunny Bid and Dash for Cash are on his papers. 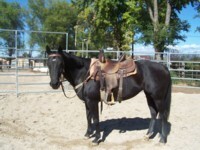 He's a real deal prospect and he's priced to sell quick. Sold 2/12/17 I think I can start to feel my heart healing... 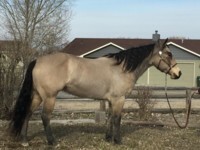 It's official, I now own this boy ?! 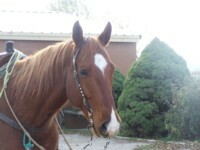 He is young and inexperienced, so he is going out for training for awhile, but I will be back on the trails this summer. 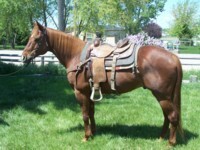 And of course he needed a new bridle & breastcollar, since I was at the horse sale anyway...???? Shocked to discover when I got home and looked at his papers - we have the same birthday!! I owe several people big time, for coming together to make sure this happened! 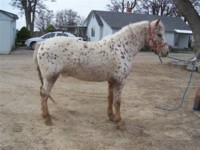 Freckles, 6 year old trail horse sold before his picture made it to the website. 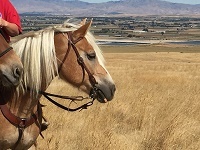 Thank you Jennifer Tinder, Hermet, California for purchasing Freckles and thanks to Cathy Campbell and Sheryl Lynde for helping make this match. 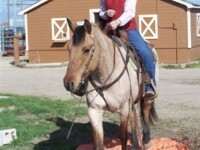 "Two Step" - Two Step was a tie down rope horse for many years and later a very successful game horse. 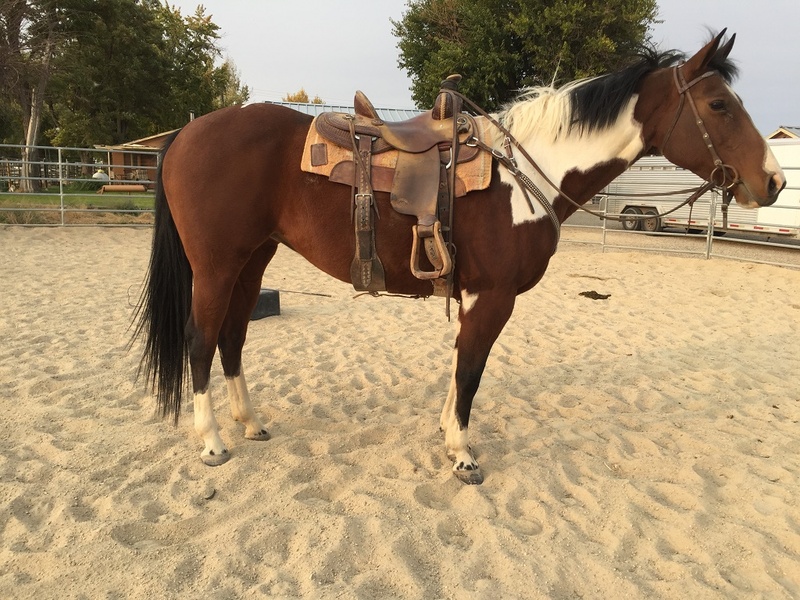 He is 20 plus, in great shape, and has a lot to teach a new rider. 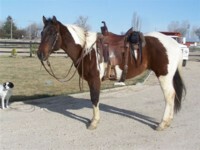 He is very good on the trail, gentle to just ride around, and he has been used as a drill team mount. 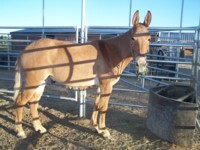 He would be great to breakaway rope and tie goats for a junior rodeo child. 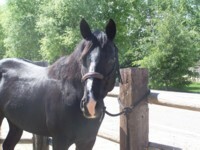 Very cute, great ground manners, gentle and friendly. 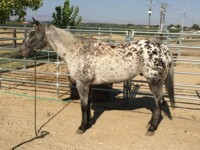 Sold 12/11/16 Thomas N Angela wrote: "Well we have been looking high and low but we have found Gracy her new running partner. 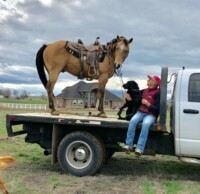 We truly have been blessed by the barrel racing community and all the people that have been sending me horses and trying to help Gracy find her new horse. 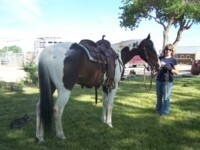 Also a big thank you to Jane Jiles and JC Performance Horses for helping us to find Bob & Marsha Hill's horse Two Step. They have some work ahead but I think they are going to make a great match!" 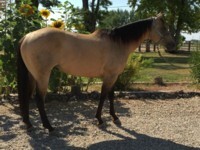 MO PEPPY CHEX aka "Ray" 2010 AQHA Buckskin All Around Performance Horse. Fancy broke and pretty,pretty,pretty! Ray is in the prime of his life. 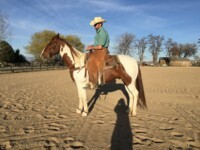 He has been carefully and kindly trained by a great California cowgirl and he shines at reining, trail, working cows, team sorting and penning, ranch work, queen court, parades, packing rodeo flags, cowboy and western dressage, mountain trail challenges, ranch pleasure, ranch roping and chores, and packing dudes on the trail. 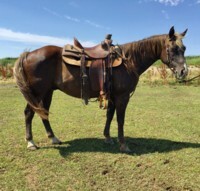 He is a fancy, sweet, athletic gelding who is double tough, can cover some country, is a smooth and steady ride and won't quit when you need him. Show stopping looks - He turns heads wherever he goes. 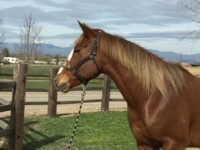 Peppi Dox, Two Eyed Red Buck, Sugar Bars, King Fritz and Bert in in pedigree - He is what he is - AWESOME! 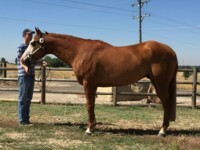 We are excited to represent this outstanding gelding. 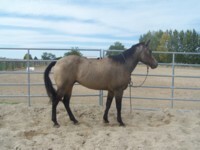 Sold 11/14/16 "Thank you Jane for finding a great home for Ray. 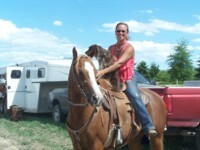 Jane did a great job representing Ray for us and she is a great person to work with!" 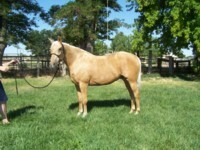 If you have a son or daughter who dreams of showing and winning at the national level this is the gelding they need. 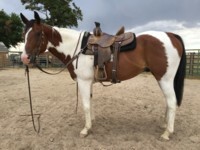 "Junior" is an amazing APHA/PHAA champion gelding. 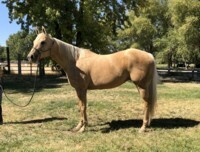 He has superiors and an ROM in hunter under saddle in open and amateur division, Superior and ROM in amateur showmanship, open, youth, novice youth, and amateur points in halter, hunter hack, trail, western pleasure, horsemanship, and hunt seat eq. 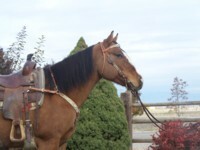 ; 118 Pinto performance points and 15 Pinto halter points. 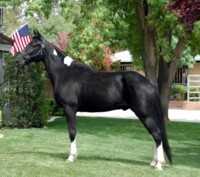 He is a "Showmanship Machine", champion shankless showmanship horse, shown and placed at world and national shows. 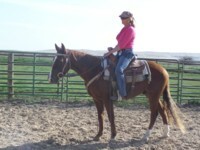 Best of all he is a fun horse, easy keeper, gets along anywhere. Loves turnout, meets you at the gate, always the same, never unwilling or unhappy, and so pretty that he turns heads wherever he goes. 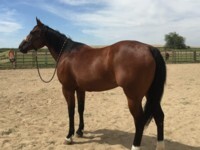 He is ready to take a new owner to the winner's circle. Sold 9/3/2016 A veterinarian and his little girl traveled from across the nation to pick up Junior and take him to his forever home. Such amazing people and the perfect home. It took longer than expected but God definitely had a plan. Dream-design come true! Jane Giles you are an amazing friend, thanks for all your help. Haley Mcgee, we will get you another one sweetheart. 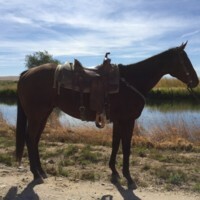 "Roany" Ready to win head horse that also runs barrels, has worked as a pony at the racetrack, and is a nice, all around, well broke gelding. 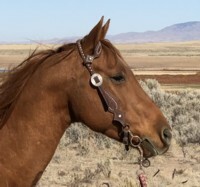 Beautiful red roan, kind and quiet, hauls, stands tied quietly and is happy in any environment. 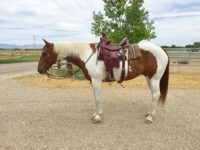 Suitable for any level roper, he's quiet in the box, quick to cattle, and he'll take you to the pay window. 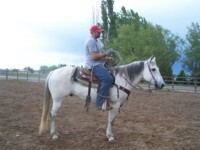 He works well as a breakaway rope horse too. 15.2 hands, 1150 pounds, 14 years old. 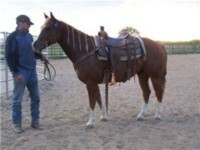 Good looking, good minded gelding with a great heart, lots of training and experience. 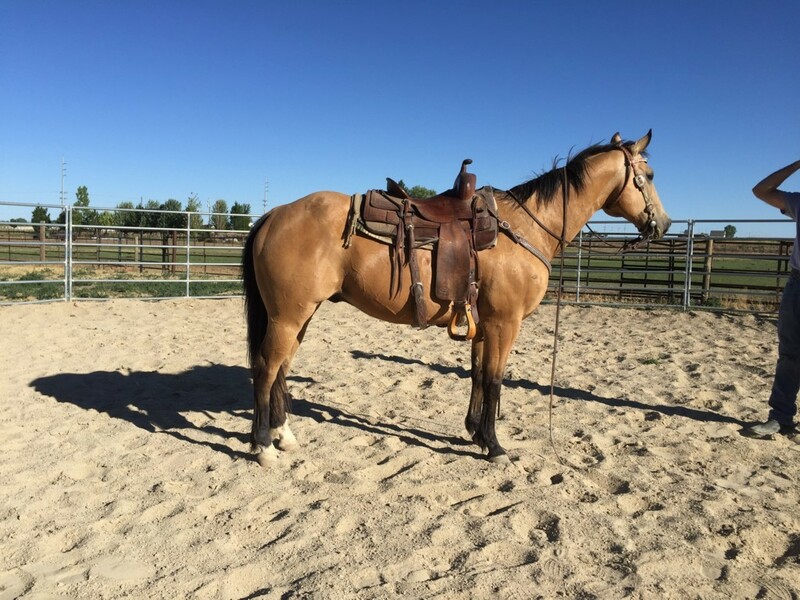 Sold 7/7/16 We sure love this gelding and we will miss him. Congratulations and good luck to the Gaasch family, Dillon, Montana on their purchase of Roany. 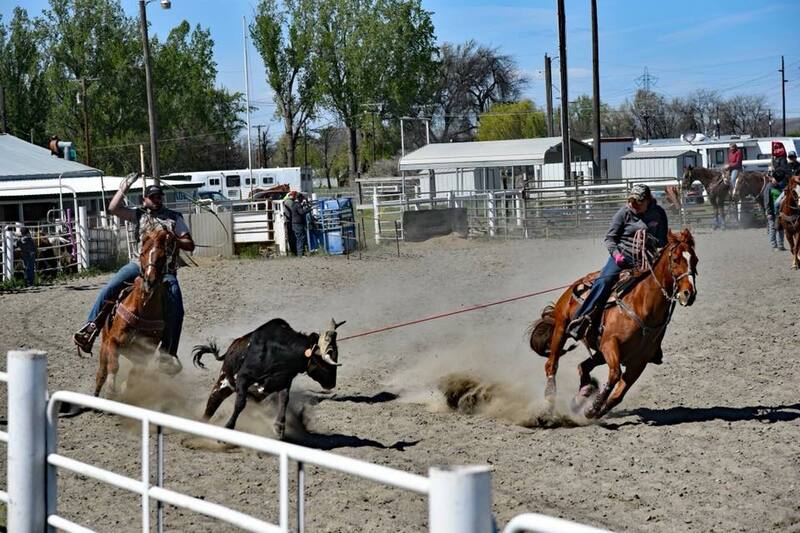 Good luck at the rodeos and the ropings. 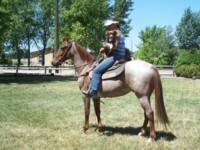 "Alf" Super cute little gelding, gentle, kind and friendly. 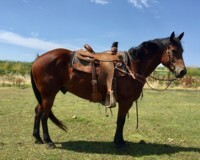 He has been used as a pack horse but he rides very well, good neck rein, very quiet and suitable for about any level of rider. 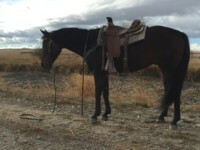 Rides great down the trail, bomb proof and sure footed. 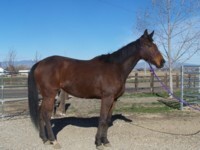 He was in poor condition when we got him but he is gaining weight and starting to look good. 14 hands, good feet and bone, very sound. 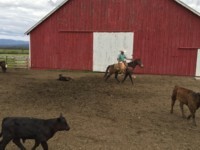 He will crib if he is confined but it is easily controlled. His crib collar comes with him. He is about 15 years old. Easy to catch, gets along well with other horses, and wants to be your best friend. 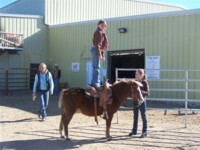 Perfect size for kids but big enough for adults to ride. 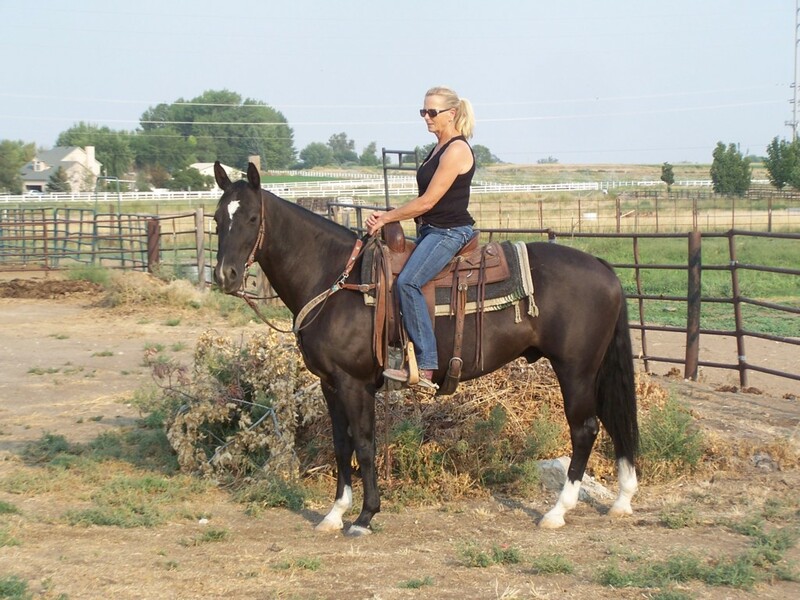 He rides well in the arena and he is always dependable, calm and safe. 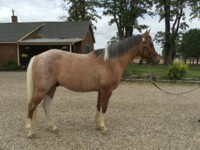 He will be a great family horse. 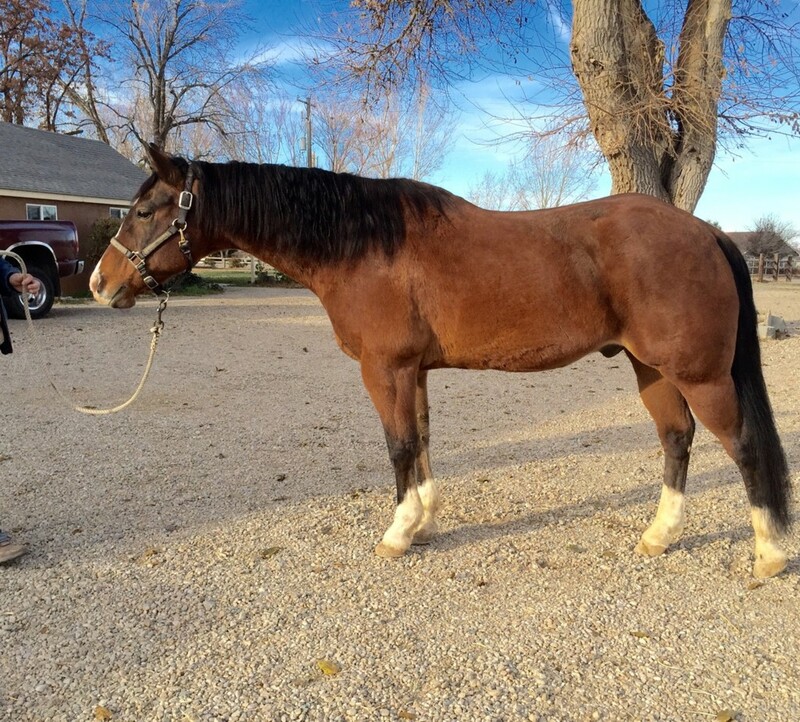 Sold 2/25/2016 "A heartfelt thanks to Brian and Kitty Bassett, Athol, Idaho for purchasing Alf. 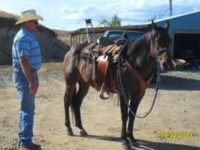 He will be teaching the grandchildren to ride and trail riding in beautiful North Idaho. We appreciate your business". 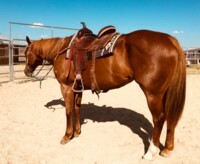 "NICK" - Broke, Big and Beautiful this gelding is ready to be your best friend. 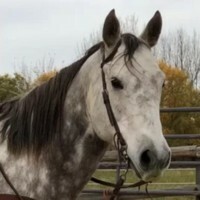 He's gentle, smooth to ride, calm, friendly,and a very pretty horse. 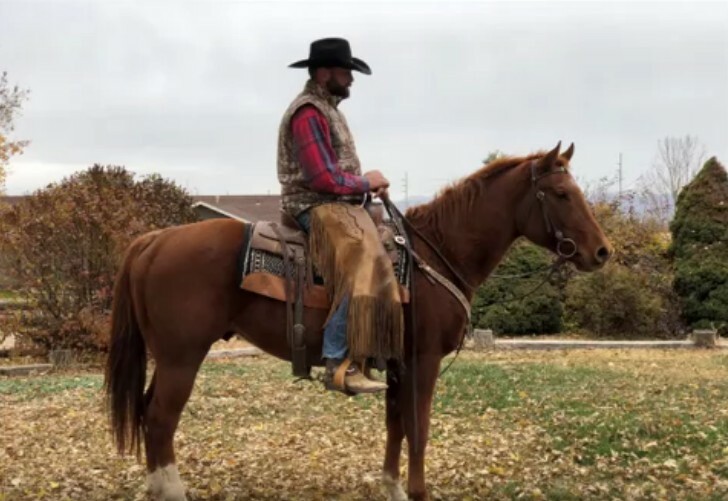 15.2 hands, 1200 pounds, 10 years old, great feet, and very stout, Nick can pack a bigger rider but he's broke and gentle enough for about anyone. 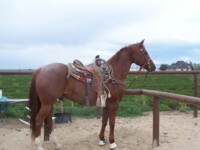 He's great to ranch rope on, he has a good stop and a nice neck rein. 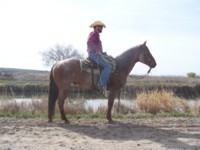 He can do any ranch chore and remain very calm and level headed. 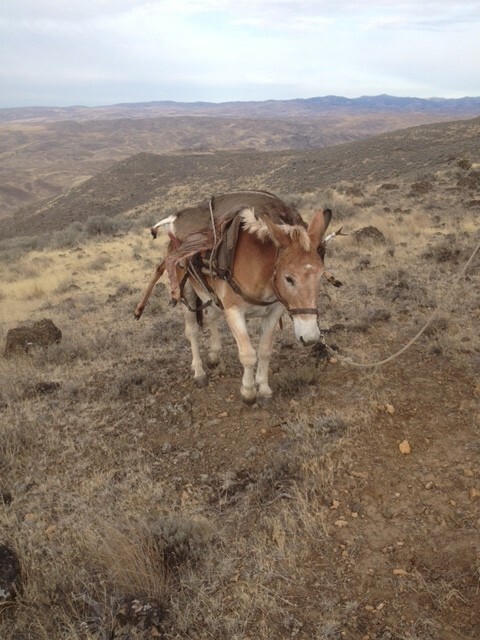 He is quiet and safe on the trail and he is used to dogs and traffic. 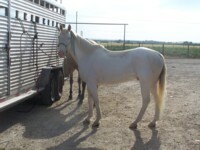 New shoes, recently dewormed, fit and ready to go to work, he is priced to sell. 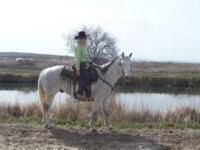 Sold 9/27/2015 Thanks Bills family, Melba, Idaho for purchasing your second horse from us. We appreciate your business! 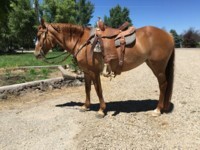 "Thanks to Luke Lowery, Jordan Valley, Oregon for purchasing this nice young gelding." 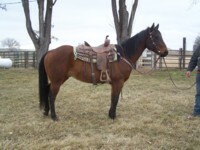 THE TRAVELING MAN, 10 year old Registered Kentucky Natural Gaited Horse, 15 Hands, 1100 pounds. 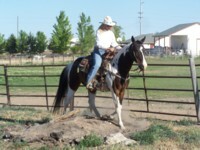 "Traveler" is a beautiful trail horse, gentle and sound, with a lot of go. 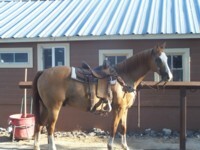 Not spooky at all, he has been ridden in the mountains, on desert trails, down city streets and parks. 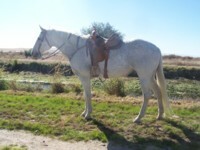 He is very intelligent, sure footed and a wonderful smooth horse to ride. 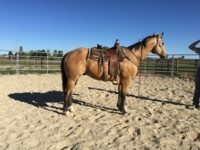 Great ground manners, gets along well with other horses, great to haul, shoe, load, stands tied, and is very patient and calm on the ground. Very suitable for an adult trail rider, he’s a go all day kind of horse with a willing attitude. 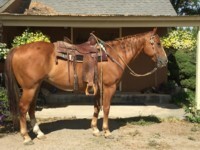 Potential to be an endurance horse, hunting horse, and a tough and willing partner. 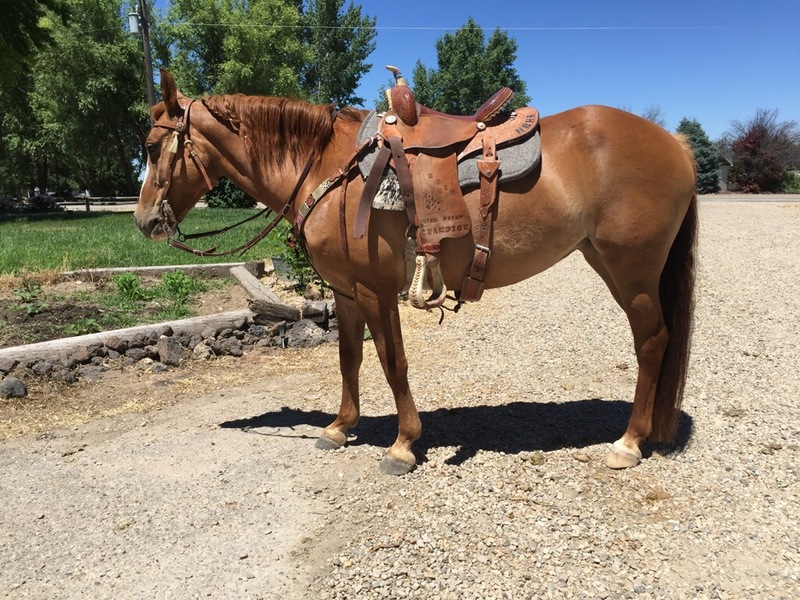 Sold 8/10/15 Congratulations to Pam Davenport, Boise, Idaho for purchasing this gelding. 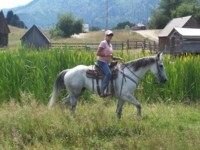 Good luck on the trail and in the endurance rides. 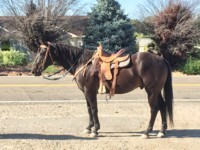 "Gizmo", 12 year old, grade gelding. 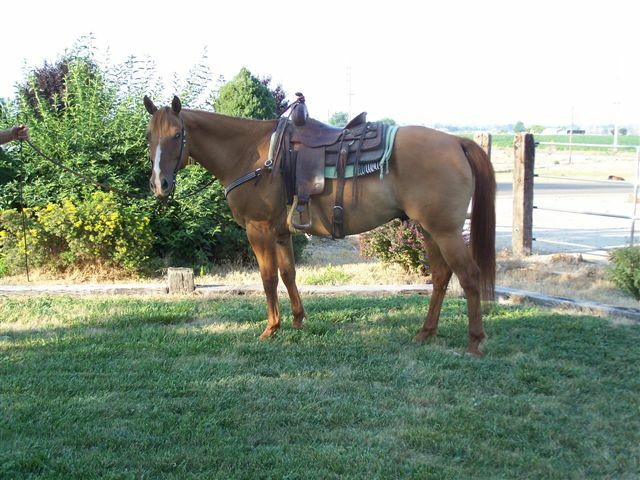 This is a go all day trail horse. 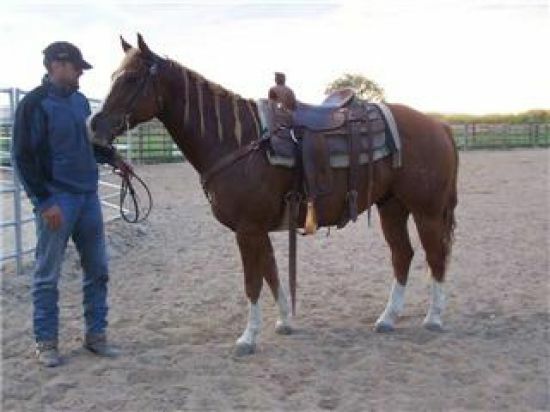 He is currently being used at brandings and to gather cattle. 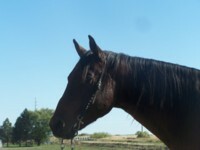 Very sound and tough, he is friendly and gentle. Great to tie, haul, easy to catch, and be your best friend. He can really cover the country with his big walk and long stride. He is fit and ready for a job. 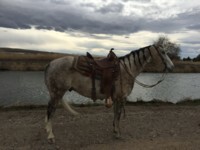 Sold 5/30/2015 "I just wanted to let you know that the grey gelding (Gizmo) that I bought from you the end of May is working out wonderfully as a trail horse for me! 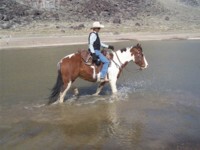 He really seems to enjoy going down the trail and he loves bridges, he'll go out of his way to cross one! He is everything you advertised and I am really enjoying him. 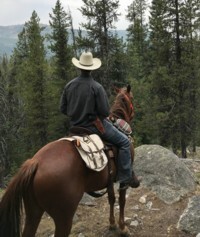 We head off for a week in the Bob Marshall Wilderness soon and I am feeling very confident that we will both have a great time. Thank you for meeting me halfway so I could try him out." 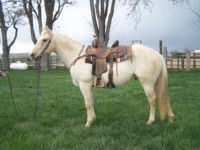 Sweet deal on a sweet filly! 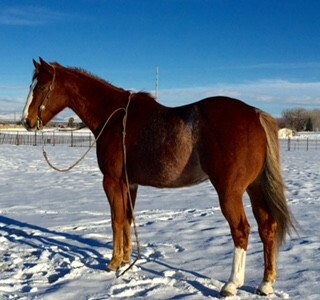 "Smarty" 2013 daughter of The Smart Bet, out of a Shine With A Twist mare. 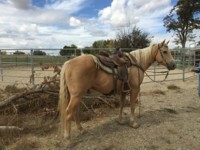 Has great potential as a reined cowhorse, barrels, rope or cut. 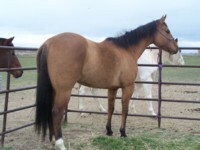 She is quick, smart and very bold, yet so trainable and a people lover. 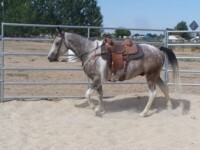 One of the smartest horses I've worked with, she tries to please and is super athletic. 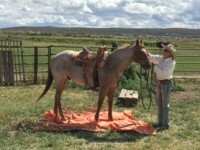 We roped her in the pasture on June 1st and hauled her home. 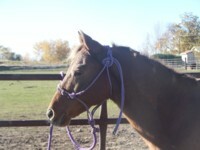 Now she round pens, ponys, loads, hauls, bathes, stands tied and is super gentle. Recently dewormed and feet trimmed. 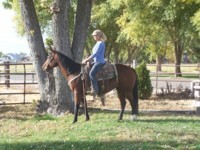 She's growing and filling out quickly and will probably mature at 15 hands. 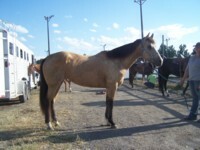 Her owner passed away so all of his horses are being sold. 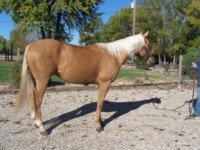 The family would like to see her go to someone who would develop her potential. They will consider any reasonable offer. 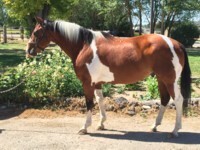 Sold 8/17/2014 "Smarty" and proud owner Cathy Campbell of Morongo Valley, California delivered safe and sound. 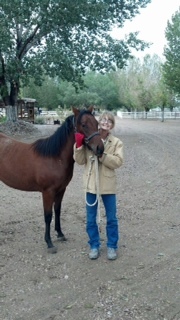 Cathy says, "I love her, She is awesome". Here is the scan of Smarty's papers. Thank you again for going above & beyond with this. 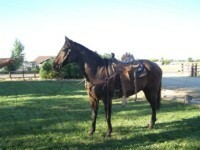 I wish you were closer, I would certainly recommend you for any of my friends who are looking for a horse!!. My husband and I purchased Olive from Jane in June 2014, and we could not be happier with our new family addition. 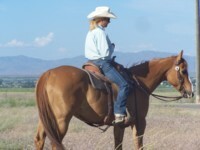 Jane was the most pleasant, patient professional we have ever had the pleasure of doing business with. 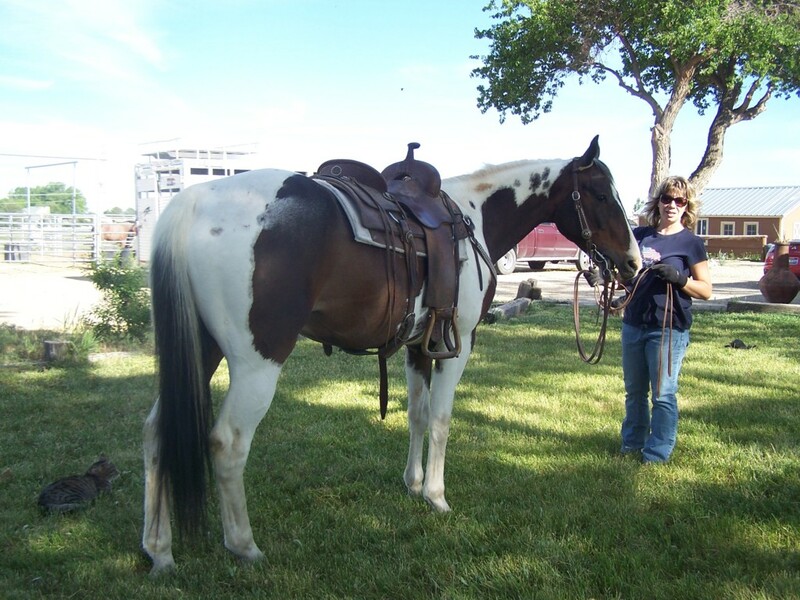 Being relatively new to horses, we had hundreds of questions, but Jane's emails were so detailed and friendly every single time. We would be hard pressed to find anyone as enthusiastic and good at what she does - Jane truly loves horses and has a passion for matching the right horse to the right owner. 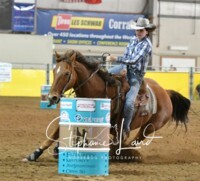 Olive couldn't have been more perfect for us, and we would recommend JC Performance Horses to anyone. Thank you so much, Jane! 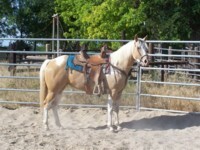 Beautiful, grade, paint gelding. 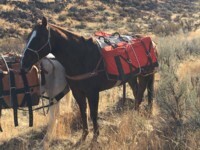 "Ranger" is a rock solid mountain trail horse with many seasons at hunting camp in the Oregon and Idaho back country. 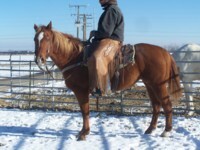 He's is suitable for any level rider and he has the strength and size to carry the big guys. 16.2 hands, 1350 pounds, wears a #2 shoe. 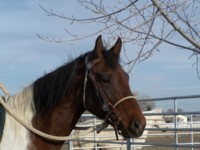 He is sound, healthy, gentle, broke, friendly and ready to go. 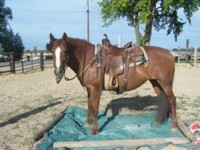 Loads, clips, bathes, stands tied, good for the farrier, loves people, meets you at the gate. 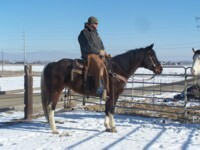 Sold 1/17/2014 Thanks to Calvin McGowan, Challis, Idaho for purchasing this wonderful trail gelding . Good luck hunting. 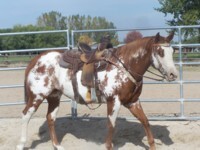 "Red Bone" He's a winner and he's ready to take a junior rodeo rider to the next level. 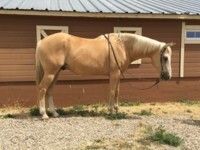 Solid, gentle gelding. Twenty years young. 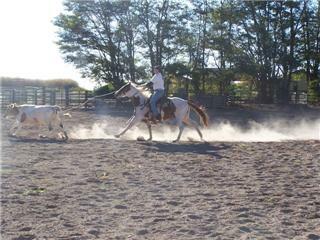 Breakaway, head, heel, barrels, poles, games. 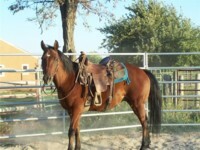 He comes with a lifetime of rodeo experience and he's ready for a new home. 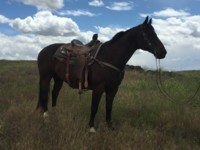 This horse has a big motor and an even bigger heart with plenty of good years left. 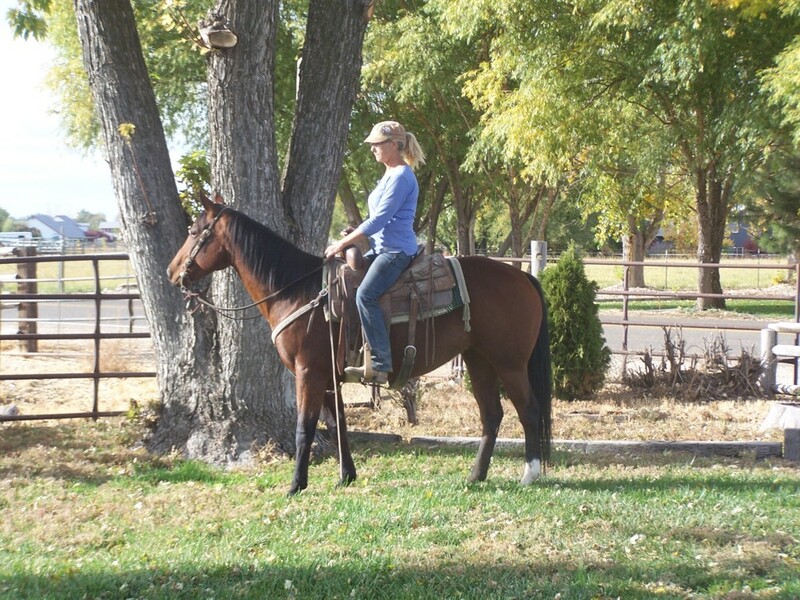 Sold 8/22/2013 Jane! 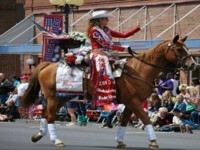 We love this horse! He's working out so well. 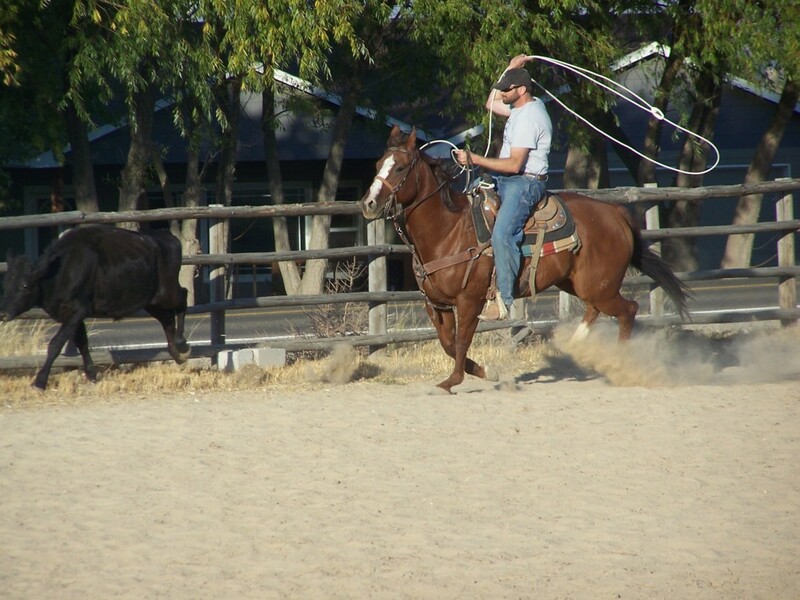 We roped tonight. He took his corner awesome! We use the same bit that Chip used. 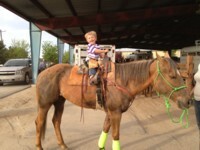 My daughter rode around on him. 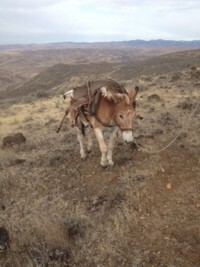 He's got just enough go you can go fast enough or just trot around. 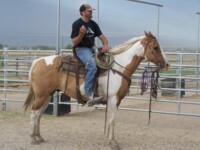 My husband roped quite a bit. He loves him. 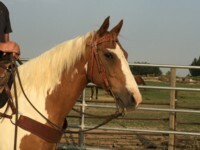 "ACE", Ropes both ends, super gentle and fancy broke. 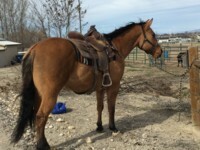 This gelding has been a winner in the arena many times but he's so sweet and broke we put our town friends on him for trail rides. 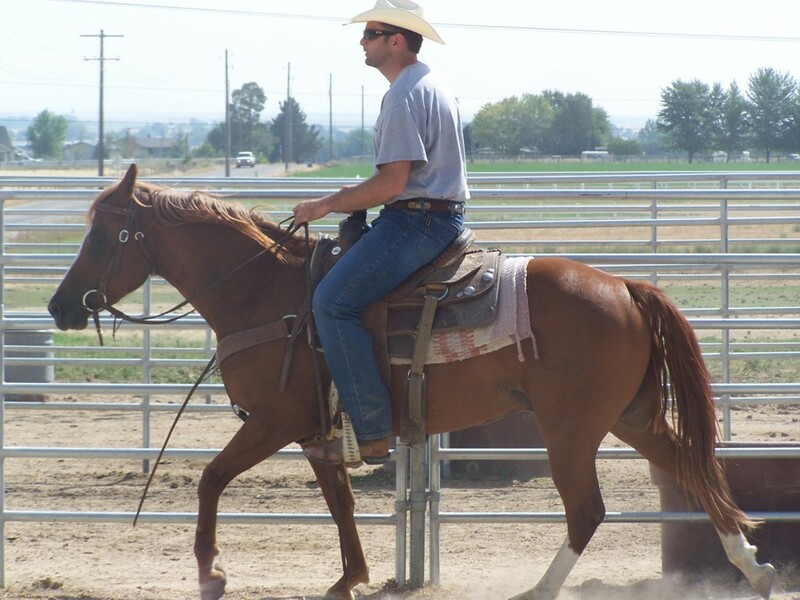 Suitable for any level roper. Scores perfect, completely honest and willing. Excellent ground manners, no vices. 16 years old, 15.1 hands, 1200 lbs. Sound, healthy and pretty! Ready to haul and win. 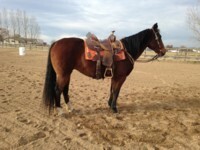 Sold 8/12/2013 Good luck to Seth Long and family, Gillette, Wyoming with this great gelding! 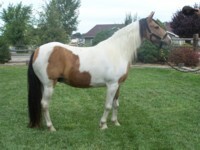 Thanks so much for making to long drive to Kuna to purchase him. 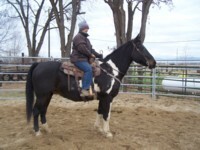 "Gibbs" Big, friendly, grade, 12 year old ranch gelding with tons of arena experience. Excellent mountain trail horse that can go all day. 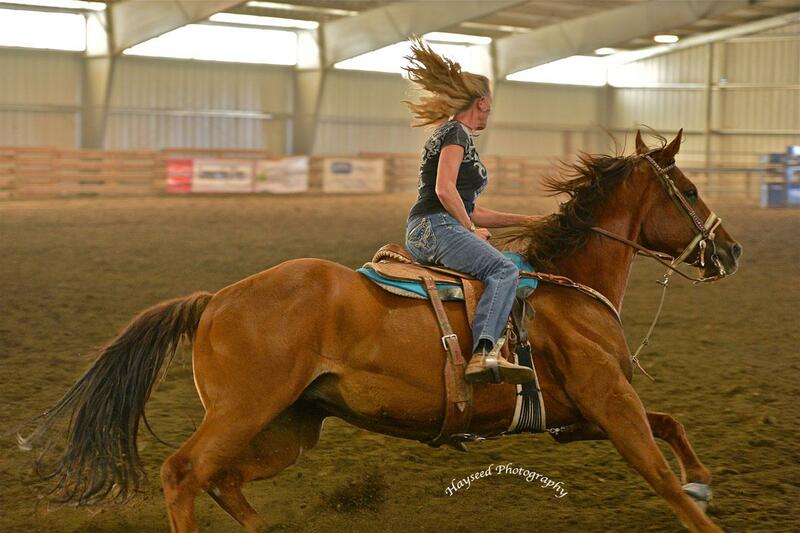 Sure footed, high energy and a smooth ride. 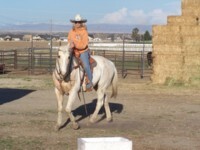 Gibbs runs a nice barrel pattern, has been used as a hazing horse and to head and heel on. 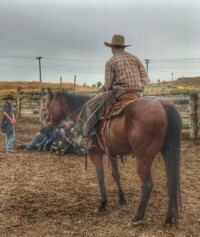 He's good to rope outside on, gather and sort. 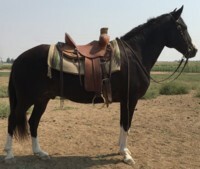 An all around kind of horse that gets along with any level rider. Awesome friendly personality. 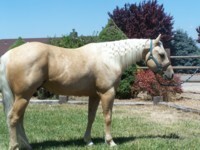 Beautiful color, conformation, and an excellent mind. 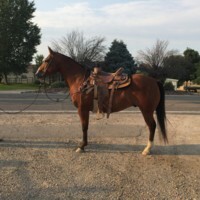 We are currently using him at the barrel races, as a trail and lesson horse, hazing at winter steer wrestling practices, and at the local indoor ACTRA ropings. 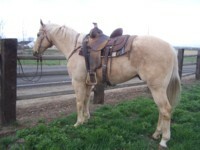 1/15/13 Sold Thanks to Shawn Phillips, Portland, Oregon on his purchase of this outstanding all around gelding. Good luck Shawn and Gibbs! 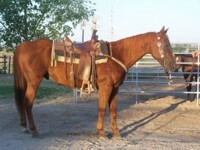 "TAZ" - Here is the real deal. 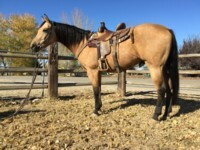 A true all around ranch and trail gelding. 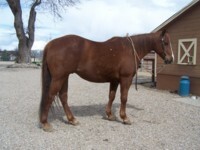 Sixteen plus hands, 1350 lbs and a heart that is bigger than he is. 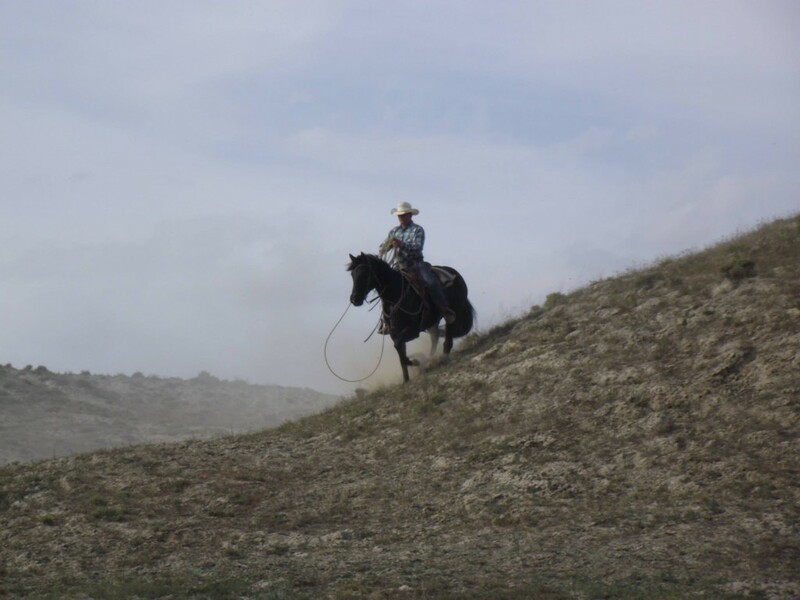 He's solid as a rock to do anything horseback. 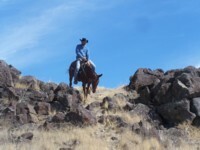 He's been to hunting camp and has traveled most of the Idaho back country. 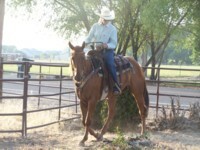 You can rope anything on him and he's so forgiving and kind that he is suitable for any level rider. 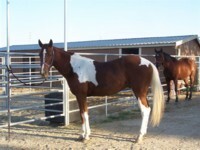 Pretty paint markings, hard as a rock feet, excellent health and guaranteed sound. 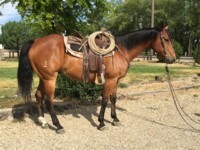 This is the kind of gelding that everyone needs and they are not easy to find. 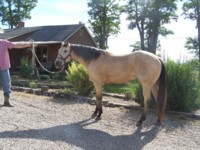 Only for sale because his owners have to downsize. Forever home required. 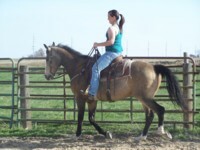 Sold We sold Taz to our friend when I talked her in to getting on him for some pictures! Good luck to Jana Bildeau and Taz. 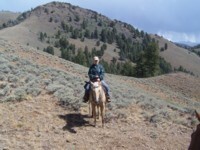 We are looking forward to trail riding with you. Thanks to Mick and Sharon Boland, Boise, Idaho for trusting us find to find a new owner for this very special gelding. 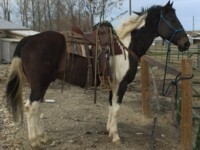 Hard to find kind of gelding. 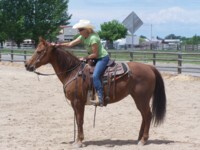 "Ziggy" is perfect for a beginner or someone who needs a confidence builder horse. 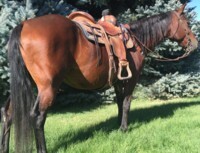 1997 AQHA gelding. 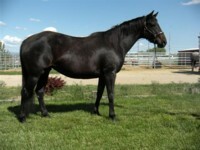 True black, perfect conformation, and a million dollar personality. 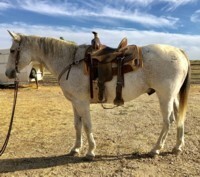 He excels at Western or English pleasure, showmanship, trail, horsemanship, western riding, babysitting, teaching kids to ride, and being your best friend. 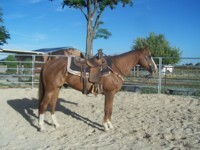 By Dynamic Deluxe (111per pts) He has Boston Mac and Sonny Dee Bar on his papers. 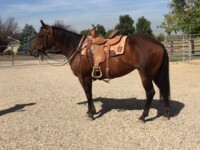 He has worked as a lesson horse and just finished his job as a confidence builder for a rider who has moved in to breed showing. 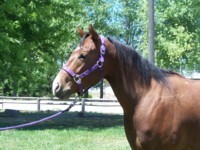 Special forever home required. 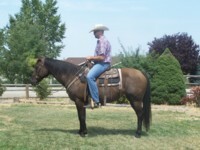 7/14/12 Sold Congratulations to the Hayword Family of Spring Creek, Nevada on their purchase of this very special gelding. 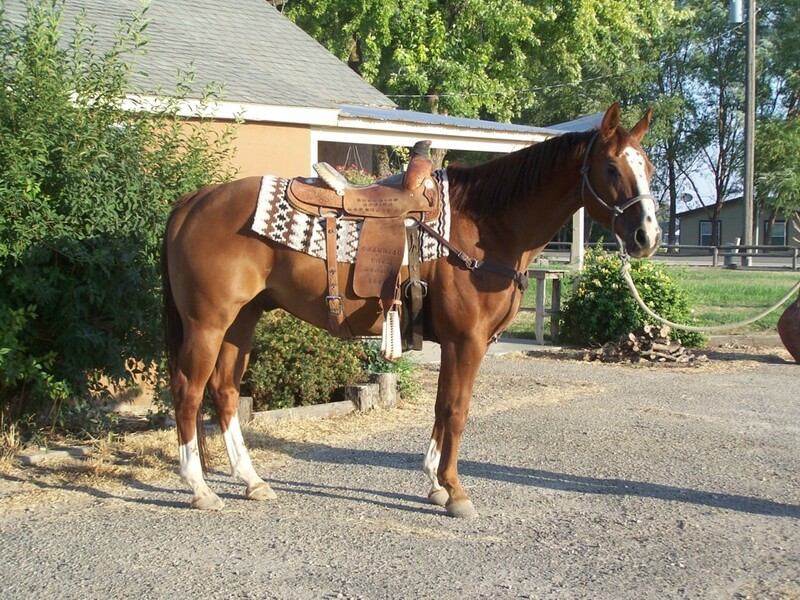 Thanks to Sadie Cook of Cook Quarter Horses, Elko, Nevada for finding Ziggy the perfect home! 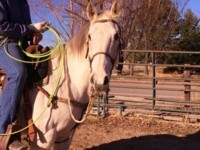 SKY Super Rope Horse!!! 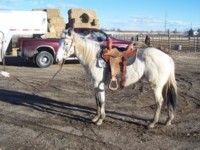 Gentle Roan gelding, excellent head horse, also heels and breakaway. 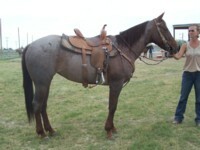 "Sky" runs a solid barrel pattern as well and could be the perfect all in one package for the young rodeo competitor. 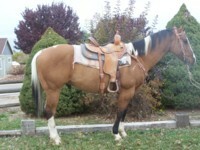 Scores well and works very solid every time with plenty of run but still rates well. 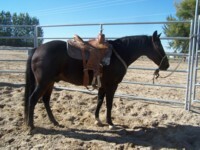 This horse would work well for a novice and has plenty of gas for the higher numbered ropings or the rodeos. 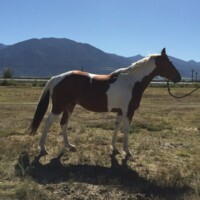 Sold “We bought Sky who has since changed his name to Red and Blues Little Angle now goes by Old Sarley We are very pleased with both. 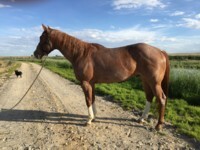 Red has taken my 13 year old son Ty to the pay window in heading and breakaway. 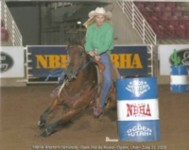 My younger son has also won numerous times barrel racing Red. 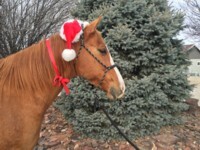 Red is Red and has a great personality. 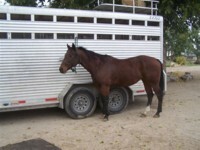 He is happiest when on his way to a rodeo or tied to the side of the trailer once we get there. 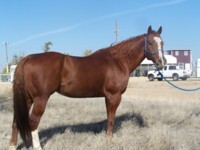 He is very athletic and a real eyecatcher. Old Sarley is on his way to becoming Dad’s head horse. 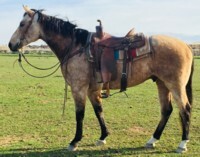 He is a big old brute, fun to ride, and one hell of a ranch horse. 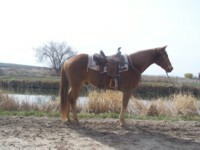 He was recently fitted with a new Wade slick fork buckaroo saddle. He is one of a kind too. 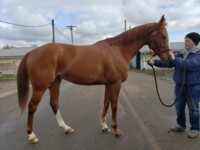 He is working out well and a pleasure to be around. The Yates family wants to thank Chip and Jane for being very fair and honest individuals. 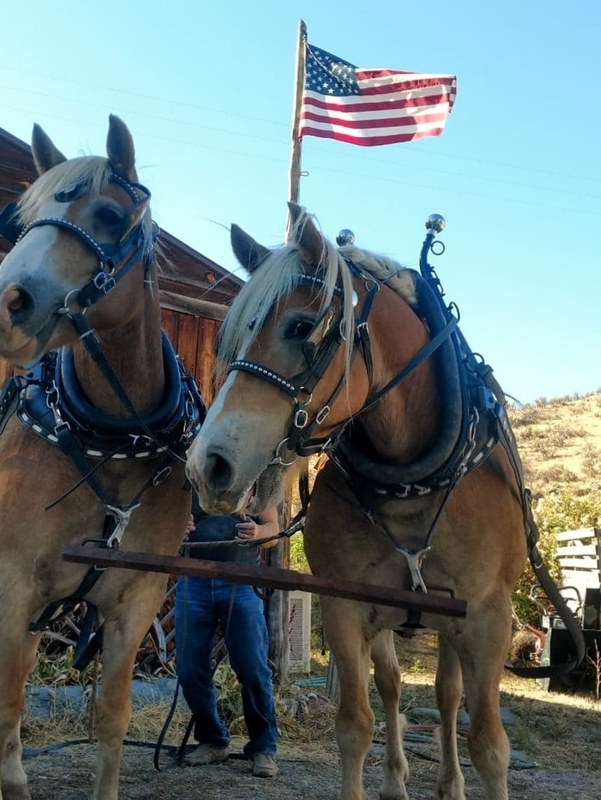 Thanks again for the good horses. Look forward to doing business in the future” . 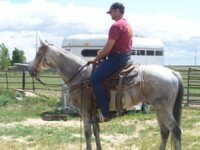 My son Joe purchased Smokey from you in Sept.08. I've been meaning to email and always get busy doing other things. Just want to let you know that Joe loves his horse. We all do for that matter. Smokey is so kind and honest. He forgives Joe for being 16 and is willing to do anything for him. 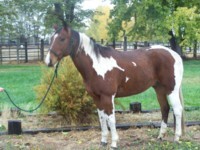 When he first got here he acted really lost but once he settled in he was good. 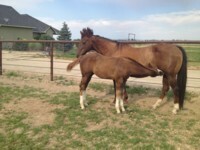 He had a hard time getting in with the other two geldings but now is great friends with the old guy. 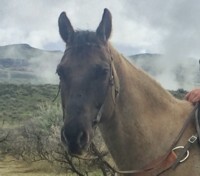 They play and Smokey keeps Poco young. 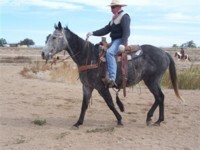 Not long after Smokey came he got a cut on his left hock that the vet said to wrap it. 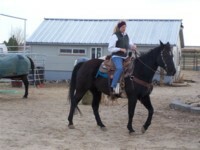 I have never had to wrap a leg wound before especially on the hock and there I was in terrible windy, snowy, weather with my face between his back legs trying to do a good wrap and he was totally still and trusting of me. His cut has since healed but it's nice to know he is easy to doctor. He is truly gentle. 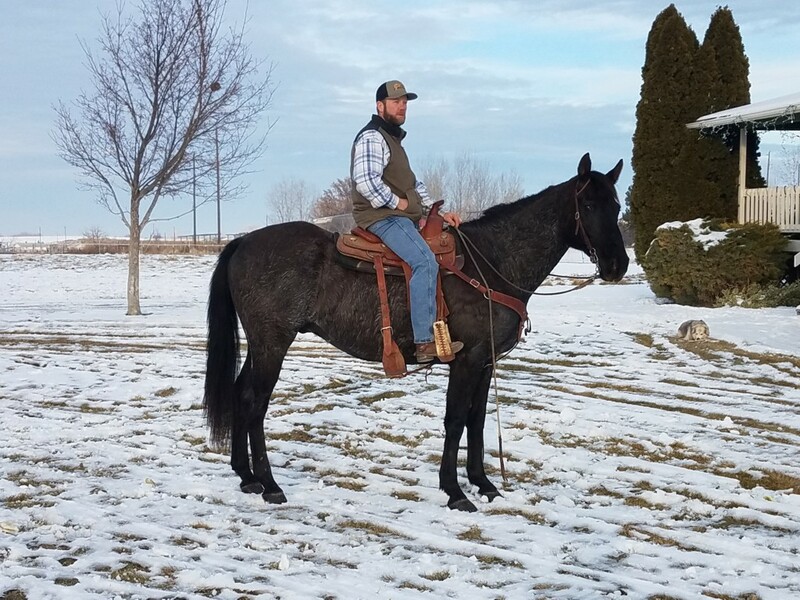 We've had a nasty, long, snow filled winter so Smokey hasn't got used as much as I'm sure he was used to, but when Joe drags him out for a ride in the pasture in a foot of snow he goes along very willing. 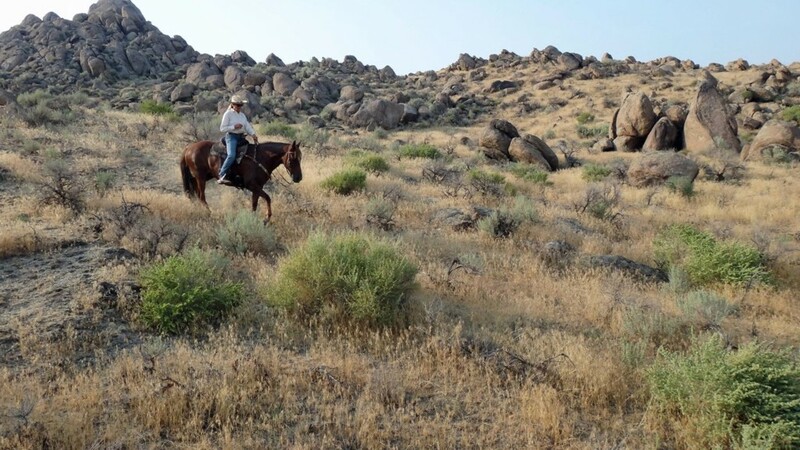 I don't know how much snow Smokey worked in at his ranch in Nevada but he is great in it here. Late last fall Joe took Smokey on a couple brushy (and I mean brush where they had to crouch on top of their horses to get through) rides rounding up cows from summer pastures. 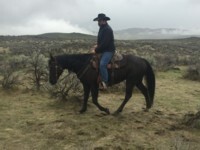 Joe had a great time and Smokey was willing and went all day in the wind and rain. 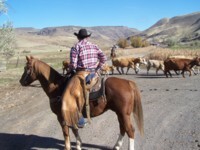 Right before Christmas he took Smokey to move cattle about 10 miles to our neighbors place down the road. They drove them right down the road in the snow keeping them out of driveways and together, with cars following and going around them. 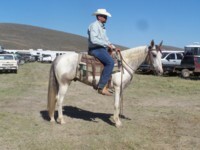 Smokey again proved himself and was great at his job. It made for a great picture in our local paper. 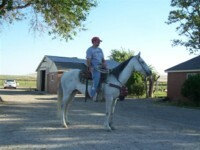 Joe really want's to send Leroy (Smokey's previous owner) a newspaper picture. 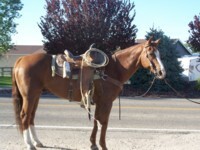 Would you be willing to get it to him or maybe we could send it directly to Leroy. 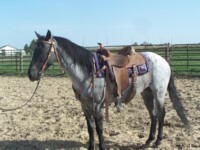 Also if Leroy would be willing, we would love to have a picture of Smokey in his life before Joe got him. 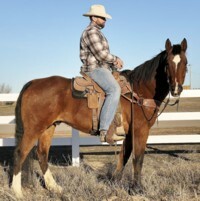 Joe said Smokey is the best money he has ever spent. Thank you so much. 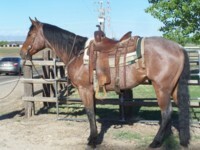 Doc's Rain Bar AQHA 15 year old gelding. 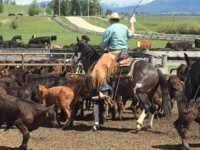 Solid steer wrestling and hazing horse. "Lakey" is sound and dependable. Scores good, lots of run, strong through the hole and absolutely no left. 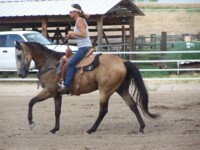 Excellent conformation and show horse good looks. 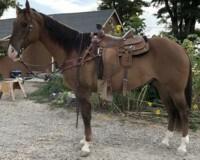 This horse is a proven winner, solid for a beginner, but enough horse for advanced riders at any level If you need a good mount for the summer come check him out, he is for sale and on sale! 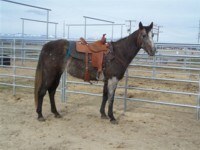 Sold Thanks to Corey Turner, Shoshoni, Wy for purchasing Lakey. 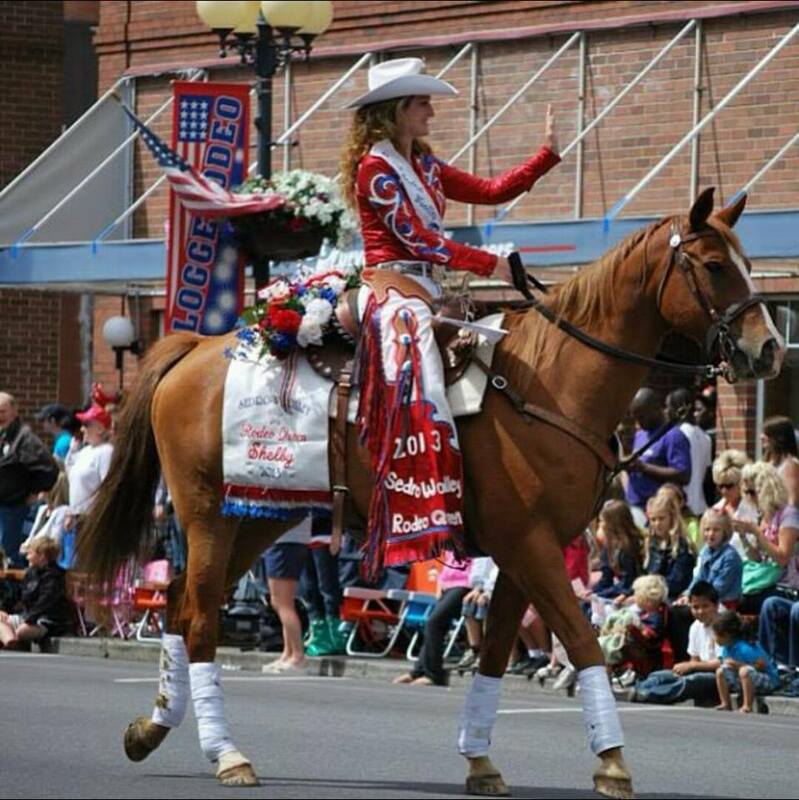 Good luck at the rodeos! Lady to the Macs, Awesome 3 year old AQHA filly. Extremely well broke, beautiful, and talented. 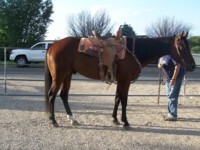 Used in the feedlot, shown in ranch horse classes, and used to head steers. She's solid in the box and we are currently hazing on her. 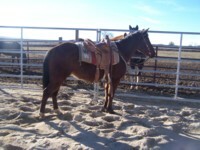 She is good in the branding pen and for all phases of ranch work. 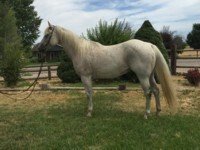 By Precision Mac, sire of numerous performers and great working horses including Watch Real Luck, #11 USTRC Champion Heading Horse. 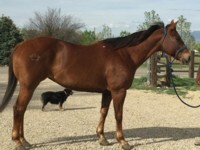 Boston Mac, Watch Joe Jack, Sugar Bars and Cutter Bill on her pedigree. Meet you at the gate personality. 15.1 hands. 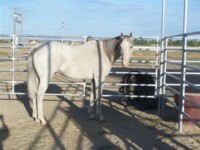 1150 lbs. 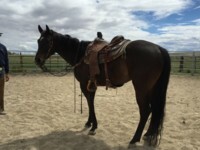 This filly is a cowoby's dream but gentle enough for anyone to ride. 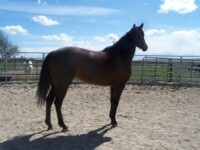 Sold "Jane, Just thought I'd say hi and let you know that "Stately" is doing awesome. Haley is loping her through the barrels and poles. 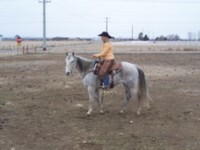 After a 3 month layoff do to all the rain here she was just as gentle and patient as she could be when we started riding this spring. Thanks again." 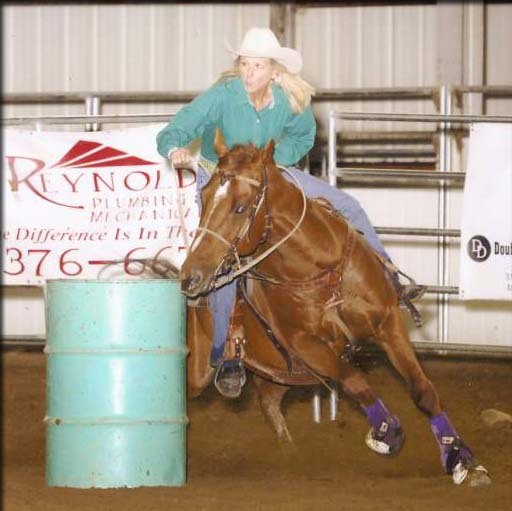 Rachael Verlot, California.